In this session we will discuss about the chips that are used as starters, side dish for raSam rice etc. We can prepare these from certain vegetables like Yam, potato, raw banana and tapioca. Of these also, only potato can be used to make raw chips and stored for frying any time. I had seen chips made from carrot, beetroot etc but they are not very tasty! For making instant chips, we can use yam, potato and banana. 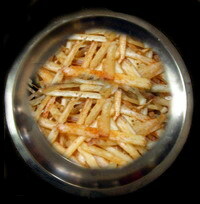 For all chips, never heat oil to the fuming point; once the oil reaches frying point simmer the flame to medium; never fry unless the oil reaches frying point; fry for 3 to 5 minutes turning side every now and then; and never store the chips when they are hot but only after they cool and the oil is drained. For this purpose and for preparing other food items using yam, you need to select only the variety that should be yellowish inside when cut and not pink since the pink variety is acidic and itches the tongue and throat too much. Yam being a tuber has a lot of clay covering its outer surface as such needs thorough washing. After washing remove the skin. Dissolve a teaspoonful of turmeric in about 500 ml water in a bowl to place the raw chips to stop it becoming brown or black. Cut the yam like thin finger chips, dices or into any other shape using a scraper but remember to cut only as thin as possible in order to have crispy chips. Place the cut chips into the turmeric water and after cutting the whole yam, let it soak for 5 minutes. Wash thoroughly under water twice or thrice to remove the starch and acidic content. Drain water and dry under a ceiling fan over a tissue paper or clean cloth. The purpose is to remove the moisture content over the surface to have dry chips before frying. Dissolve fully two tsp salt in 4 tsp water and keep aside. Ensure that there is no solid salt particle as otherwise they will splutter too much later. Heat oil in a thick bottomed wok (KaDAi) and never allow it to fume. To test whether it had reached the frying point, after a few minutes, drop a small piece of dried yam. If the oil is ready, the piece will jump up to the surface with air bubbles coming out. This is the point where you have to simmer the flame to medium. Fry the cooled dry chips in such a way that they are immersed in the oil. Turn the chips from time to time to fry all the sides and stop them becoming too brown. After 5 minutes, sprinkle the salt solution over the chips when they are frying. If you find it difficult then you may directly add ¼ tsp salt solution to the oil. The oil may splutter a little but the salt will stick to the chips. 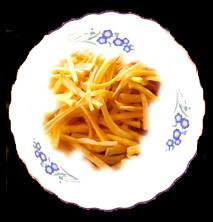 After frying for another 2 to 3 minutes, simultaneously turning the chips, when the chips become golden coloured, remove the lot and drain the oil placing them over a strainer. This way fry the entire quantity of dry chips, each time sprinkling salt solution. Let the oil be strained and the chips cooled. Heat a pan for 2 minutes and remove from the fire. Add the red chilli powder and sauté for a few seconds. Sprinkle this over the chips adding more salt if needed and toss for a while to allow the chilli powder and salt to spread uniformly. Serve. If you want to store then do it in an airtight container. Anyway you cannot use it for more than two days if you want crispness. Some people may add rock salt, some may use pepper in place of chilli powder or cumin seeds powder with pepper powder. It is optional. Some people use red chillis in place of powder and grind it with salt to have better taste. Here you need to grind it finely. The banana should be hard and not tender. To test this just tap with your nail over the banana and it should make a sort of sound when you tap a hard bound book. 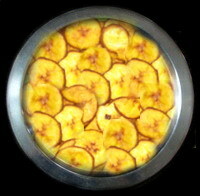 If you want to use the famous Kerala ‘nEndirangAi varuval’, then also the banana should be hard but not very raw. It should be hard but slightly yellowish (slightly ripe). Either you can place them in water for about an hour before peeling or straight away peel the skin. Cut into slightly thicker discs (since thinner one will burn). Place the discs in the turmeric dissolved water as above for 5 minutes. Wash and cool dry. The rest of the procedure is exactly same as mentioned above for yam chips. For nEndirangAi chips, use coconut oil in place of refined oil. Similarly do not add any chilli powder to these. 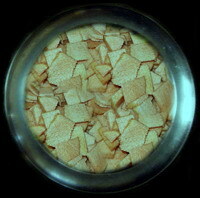 Wash tapioca which is also called kappaikkizhangu. Its chips are hard and some may not like. Remove the skin and cut into thin discs or into long thin pieces vertically. After washing them thoroughly under water, cool dry to remove moisture. Then directly fry as above following the rest of the procedure as detailed. This does not need turmeric solution. You can prepare this also following the same procedure but after removing the seed from the fruit segment, cut the segment into oblong shaped pieces and follow the rest of the procedure as above. This entry was posted on March 12, 2013 at 10:19 pm and is filed under Kadamba Recipes with tags banana, chips, jack fruit, kappaikkizhangu, maravallikkizhangu, nendirangai, red chilli powder, refined oil, Senaikkizhangu, table salt, tapioca, turmeric powder, Varuval, Vazhaikkai, yam. You can follow any responses to this entry through the RSS 2.0 feed. Both comments and pings are currently closed.